The Mist Collection. Navy Mist with Prizm Black Lens. Matte Black with Prizm Ruby Lens. Woodgrain Collection. Woodgrain with Prizm Daily Polarized Lens. Polished Black with Grey Lens. Steel with Chrome Iridium Lens. Polished Clear with Violet Iridium Lens. Black Ink with Positive Red Iridium Lens. Scuderia Ferrari Collection. Matte Black with Ruby Iridium Lens. 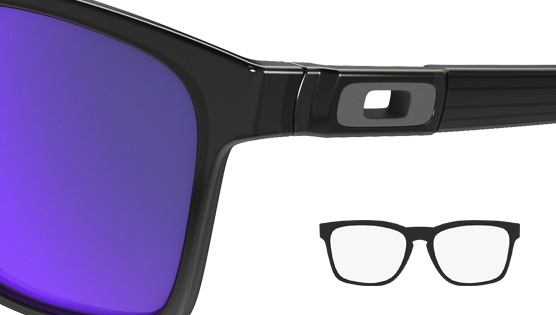 Matte Black with Black Iridium Polarized Lens. The method of only using lenses cut from the same sheet of plutonite, a material inherently capable of filtering UV & harmful blue lights, like no other, means the optical clarity is isn't compromised and the XYZ Optics stop distortion in its tracks across the whole of the lens. Add the amazing High Definition Optics (HDO) that Oakley have created and you have uncompromising Optical Clarity, Visual Fidelity and Impact Protection. Comfort and Durability from the stress-resistant O-Matter™ frame material are standard and the Catalyst comes with some neat little Unobtanium Icons in the ear stems to complete a great feel with this style.